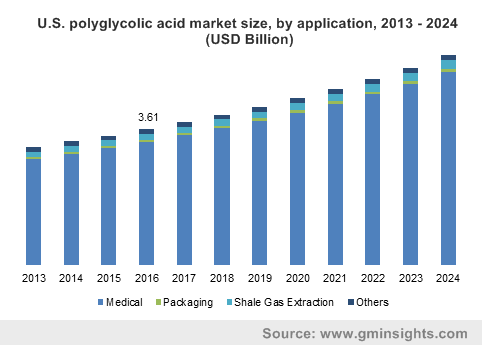 Polyglycolic Acid Market size was over USD 6 billion in 2016 and will witness growth over 4.7% by 2024. Global polyglycolic acid (PGA) market is projected to witness substantial demand in medical industry in the near future. Rising demand for absorbable suture and other advanced surgical tools has been the significant trend in medical industry propelling the polyglycolic acid (polyglycolide) market. The U.S. healthcare expenditure was USD 3.3 trillion or USD 10,348 per person in 2016. Additionally, healthcare investment accounted for close to 18% of the total of GDP in 2016. Such factors will boost industry growth by 2024. The product has a range of applications in medical sector including: absorbable sutures, biodegradable bone graft polymers, in regeneration of organs, dental surgeries, scaffolds in cell culture & transplantation and in drug delivery vehicles. The use of absorbable sutures circumvents the need for re-surgery for suture removal, which is likely to be a key factor propelling the polyglycolide market by 2024. The product has been gaining acceptance amongst other synthetic suture materials such as: polyglactin, poliglecaprone, polydioxanone, polydioxanone. Several factors such as: upward obesity rates, expanding incidence of hypertension and growing percentage of geriatric population have led to strong potential for PGA in the cardiovascular surgeries. Modern trends in the packaging industry will also drive PGA market size in the coming years. The product has been approved as a biodegradable plastic by the U.S., Europe and Japan governments. The non-degradable packaging wastes including: films, bags and bottles have led to evident pollution in the recent decades. Furthermore, non-degradable plastic bags have been restricted or taxed in Ireland, Germany, South Africa and Taiwan owing to the concerns over their disposal. Such trends present brighter aspects for polyglycolide demand for packaging by 2024, on account of its bio-degradable characteristics. Polyglycolic acid features high hydrolytic instability, which result in very quick degradation. This has been a limiting factor to its applicability in several medical innovations. For increasing the hydrolytic stability, various co-monomers have been experimented; however, the resultant materials exhibit inferior properties compared to the PGA homopolymers. Lack of cost effective & high-volume manufacturing techniques have led to relatively small-scale production feasibility for the product in recent years. However, the market size is probable to grow over the forecast timespan with Kureha Corporation’s cost-efficient innovations in this area. Fiber form held a massive share over 40% in 2016 and is expected to rise substantially over the forecast timeframe. The fibrous PGA have been used as monofilament, braided form or in mesh structure. Fiber form will hold substantial demand by 2024, in the medical industry for usage in sutures, stents, scaffolds, adhesion barrier reinforcement, in artificial dura, etc. The film form is estimated to grow with a high CAGR of close to 8.5% over the forecast timespan. Film form has been gaining popularity in packaging industry as a coating material for PET bottles. Polyglycolide demonstrates a high retention for commonly used flavors & aroma groups for instance, d-Limonene, L-Menthol, Vanillin, etc. Moreover, the unique combination of source reduction, recyclability and inherent barrier characteristics makes polyglycolic acid a desirable material in packaging. Several merits of polyglycolide in shale gas extraction include: enhancing the productivity, cost- and operational efficiency of hydraulic fracturing operations. PGA downhole tools eliminate the requirement of costly drill-out processes, since they degrade and dissolve in water after use. Shale gas extraction is expected to be the fastest growing sector with CAGR above 8%, for polyglycolide demand by 2024. Packaging applications constituted about 30% share in global polyglycolide market in 2016. Extending the shelf life of food has been one of the challenges of food & beverage industry. Recently, modified atmosphere processes have been used for this purpose in case of meats and fresh food. Packaging with multilayer structures aimed at longer shelf life involve metallized materials for snacks and result in producing the products with difficult recycling process. PGA has proved out to be an efficient bioplastic material in this context, with ideal bio-degradable potential. The product exhibits superior abrasion resistance compared with the conventional poly phenylene sulphide (PPS) and poly ether ether ketone (PEEK). Also, flexural strength of the product has proven to be exceeding those of traditional engineering plastics. Shifting preference towards biodegradable plastic packaging of food & beverages presents lucrative prospects for polyglycolide market by 2024. North America led the overall polyglycolide market in 2016 with a massive share above 60%. The region is estimated to witness significant demand for polyglycolide in shale gas extraction in the coming years. The U.S.’s leadership as the innovative producer of shale gas in recent years has established it as a possible catalyzer for global energy change. U.S. Energy Information Administration (EIA) has projected that the U.S.’s total natural gas consumption will rise to 31.6 TcF by 2040, with 56% of the rise in natural gas production resulting from the upward development of shale gas. Europe has been profoundly investing in projects entailing the development of recyclable food packaging solutions, for instance, RefuCoat. The project aimed at formulating a hybrid coating with oxygen- and water vapour-barrier properties. It involved combining polyglycolic acid with modified silica oxide for savory products, as an alternative to the metallized packages. Europe polyglycolic acid market will also observe escalating growth of around CAGR 8% by 2024. 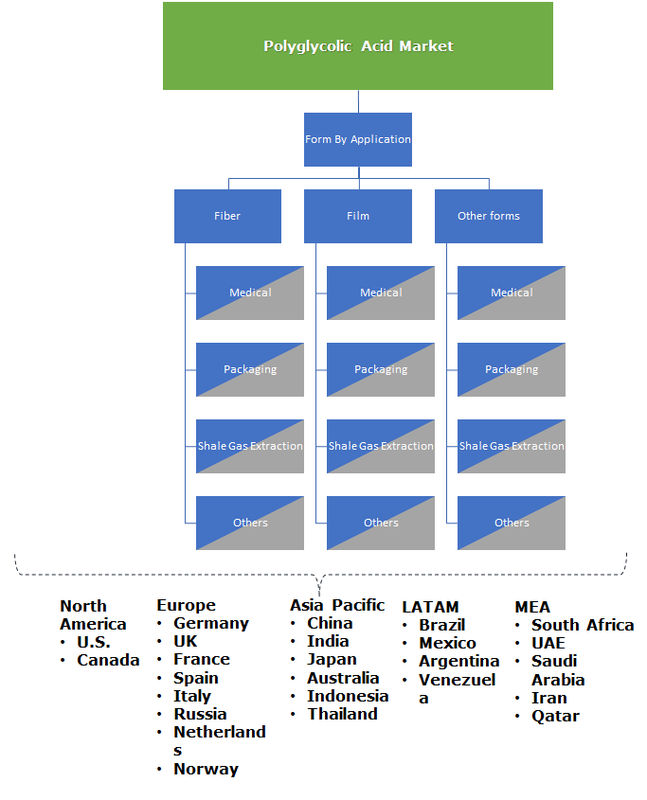 The global polyglycolic acid market was highly monopolistic in nature in 2016, with Kureha Corporation being the only industrial-scale manufacturer of the product. The company holds strong developmental strategies for expansion of its business beyond North America in the near future. While medical sutures are the prominent applications of product, Kureha aims development of new applications using its patented cost-effective techniques. Other PGA industry participants include: Corbion N.V., Polymtek, BMG Incorporated, Huizhou Foryou Medical Devices, etc. Corbion & Evonik are the top leading suppliers of PGA in bone graft substitute market. Polyglycolic acid belongs to the family of aliphatic polyesters. It is a thermoplastic polymer and features biodegradability, high biocompatibility, high strength and low gas permeability. The product is prepared by ring-opening polymerization or polycondensation of glycolic acid. The product has been widely used in medical absorbable sutures manufacturing; however, various advanced medical applications have been discovered in the recent years, along with non-medical applications including: packaging, shale gas extraction, etc. The industry is at the nascent stage presently with robust growth potential in the near future.